OA Digital will soon release a historical tour application for Openmoko and Android based handsets. As the user walks around an area, be it a city, rural landscape or otherwise, nearby points of interest will be highlighted and explained. The application aims to be an aid to exploratory walks around an area rather than a scripted or prescribed tour, as such, the application represents an opportunity to utilise new forms of dissemination for existing content in a manner that is intuitive and engaging for users. In this example the application displays a map, historic or modern, and highlights to the user historical features of Oxford's cityscape. The application will be sold via the Android marketplace and is easily customised for new content or geographic areas. 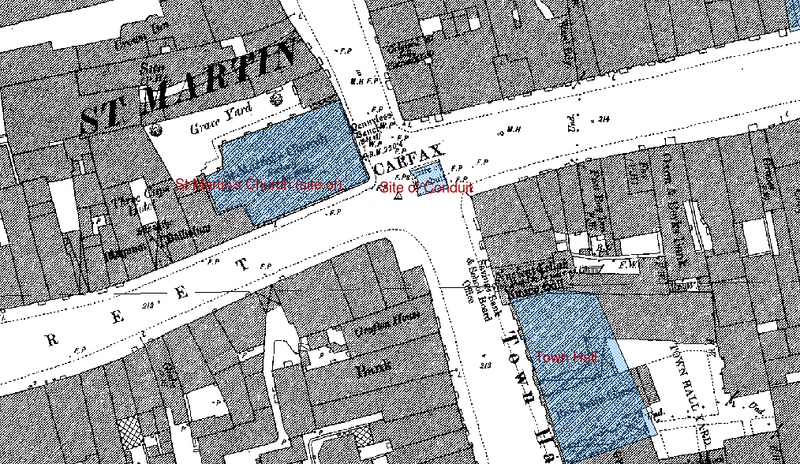 Below is an image showing development of the Oxford version of the application; we have obtained 1st edition Ordnance Survey mapping of the town centre and drawn a shapefile containing features that we would like to highlight to the user (in blue); these polygons have information attached concerning the name of the feature (labeled in red on the image below) and further data, such as text, images or audio, to be displayed to the user. Within the application this shapefile is not displayed, the user has the option of viewing either historic or modern mapping (delivered via WMS if appropriate, please see our webmapping example), with the data attached to the shapefile presented as the user approaches it. The application is based on a fork of gvSIG Mobile and is a novel means of presenting data within a GIS environment. Please contact us to discuss the possibility of utilising this application for your dissemination requirements.